Dr Gupta frequently performs 4 Dimensional body Contouring procedures like 6 Pack Surgery, Hour glass figure surgery in women, deltoid shaping, pectoral shaping etc. He has trained with Dr Alfredo Hoyos in Columbia, who is the inventor of these procedures. These procedures involve a delicate VASER Liposelection procedure to shape specific areas to give a muscular appearance. The key step is to superficial liposuction. The 4 D Contouring involves a Dynamic component to mimic muscle appearance even in motion. So the procedure has both a static as well as dynamic component. So many of us today dream of a six pack body. Six pack body has become the icon of beauty.Through this surgery, women also can get a well-shaped hour glass body. Vaser 4D techniques for six pack surgery reveals thr hidden muscle definition areas such as abdomen, upper arms, chest, legs, and back. In Vaser the surgeon melts away the body fat with ultrasonic energy in order to remove the layer of the body fat that sits on the top of the abdominal muscles. Oh to flaunt a 6 pack on the beach !!!!!! VASER technology is used to create 6 pack, or 8 packs in men. 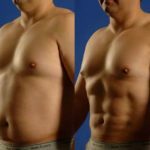 With the concepts of 4D body contouring within 4-5 hours we can create the most natural looking 6 packs for the male abdomen. An athletic patients is an ideal candidate, however this can be performed on most patients as well. The key in this procedure is to highlight the muscles that we are creating, both at rest and animation. This is the basis for the VASER procedure. Then the Vaser is done in the deep and the superficial plane to selectively remove fat leaving with enough to mimic the muscles exactly. This is Usually a day care procedure, followed by 4-5 days of rest. Normal office work can start on the 5th day, and strenuous gym by 3 weeks. Pressure garment stays for 6-8 weeks. The pressure garment is a specially designed garment with an inner foam jacket and out outer lycra thin garment. liposuction continues to be the commonest plastic surgery procedure worldwide. With continuous improvement in technique and technology, we are seeing better results. The newest addition is 4 Dimensional or 4-D body contouring. This concept proposed and invented by Dr Alfredo Hoyos, from Columbia is fast gaining ground in body sculpting and 6 pack surgery. Dr Gupta, has trained with Dr Hoyos in this surgery and performs this procedure regularly in his practice. 2. Motivation of the Patient to Maintain the Results of the Procedure. 1. Like any Plastic Surgery, the first step is a proper clinical consultation, history, examination to rule out contraindications of procedure, explain the possibilities, limitations and assess suitability for procedure. Pre procedure investigations are then performed for anesthesia fitness. All such procedures are performed under anesthesia in hospital setting. These are long procedures, 4-5 hours duration, and proper monitoring is essential. 2. Markings are the key of the whole procedure. This helps to define the muscles that are going to be worked on. In addition areas for fat injection, are marked, for example , chest, deltoids etc. It is essential that you maintain weight and do not gain . Regular exercise will enhance the shape even more. The final appearance can take 3 months. Most of the men these days dreams of a six pack body. Six pack body has become the icon of beauty. Even some women like six pack surgery, to not build muscles, however to correct their figure. Through this surgery, women can access a well-shaped hour glass body. Vaser 4D techniques for six pack surgery can reveal your hidden muscle definition around your abdomen, upper arms, chest, legs, and back. Vaser is an innovative treatment which can help you in achieving everlasting six pack. Plastic surgeons consider Vaser better than the traditional surgery. Because, it can get rid of localized pockets of fat and be used to etch or carve the tissue to create a six pack. The surgeon breaks down the body fat with ultrasonic energy in order to remove the layer of the body fat that sits on the top of the abdominal muscles. In order to remove the fat cells quickly and easily, the surgeon will use tumescent fluid to numb the area. Stubborn body fat and tissues can be broken down by using the effective, high-frequency sound waves. By using a small cannula, the loosened body fat will be taken away gently. Then, the surgeon will target on more deeper fat sitting layers on the abdominal muscles. The surgeon will remove the body fat that sits along the muscle lines or the abdominal muscles during this procedure. There is a chance where the surgeon work only with the abdominal muscles and there must be some amount of body fats hidden anywhere in the muscle line. So, it is important to have the surgery with an experienced surgeon. After the procedure, the skin will revoke and heal quickly. You may have to wear compression garments around the abdomen for several weeks after surgery. It can promote quick healing and also to achieve more engraved and shapely look. If you feel swelling or pain after the surgery, you might have to take medication according to your surgeon’s suggestions. Full results can be achieved in about six months after the surgery. The surgeon will suggest you not to lift any heavier thing that weigh more than 10 pounds for a few weeks after the surgery. Vaser six pack surgery can be considered as one of the best options for you if you want to achieve your dream body shape by extracting the unwanted fat from your body. The result of the surgery will be everlasting. You might have to follow the exercises and procedures that the surgeon suggests you to follow. It might help you to maintain the surgery results.